"The physical touch was important, to remind me I was safe and directly connected to people doing healing work on my behalf," she wrote in an e-mail describing her experience last spring. Then, using their voices and acoustic instruments - bowls made from crystals, an Australian didgeridoo, bells and drums - the participants gently bathed Ms. Harada in sound. When the sonic massage ended several minutes later, Ms. Harada's eyes fluttered open. She felt grateful, peaceful and when she stood up, found that the range of motion in her shoulder had increased. For decades people have relaxed and meditated to soothing sounds, including recordings of waves lapping, desktop waterfalls and wind chimes. 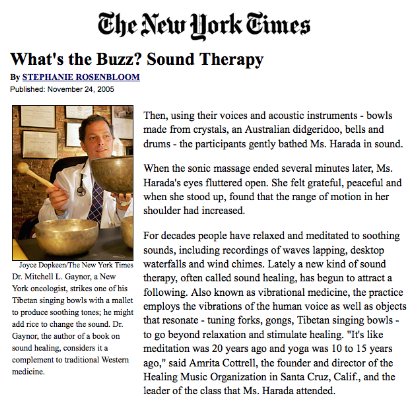 Lately a new kind of sound therapy, often called sound healing, has begun to attract a following. 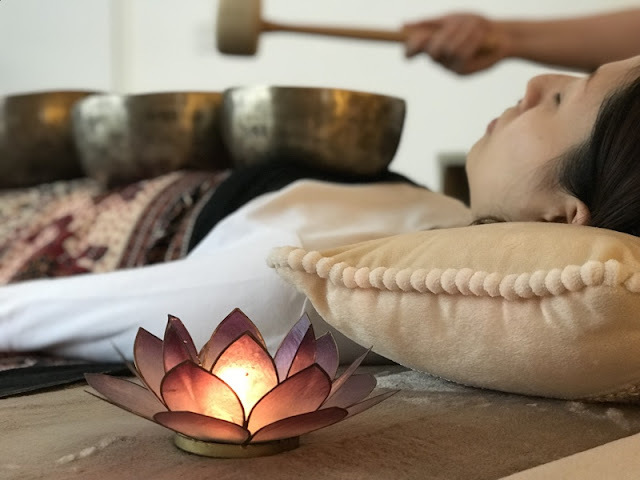 Also known as vibrational medicine, the practice employs the vibrations of the human voice as well as objects that resonate - tuning forks, gongs, Tibetan singing bowls - to go beyond relaxation and stimulate healing. "It's like meditation was 20 years ago and yoga was 10 to 15 years ago," said Amrita Cottrell, the founder and director of the Healing Music Organization in Santa Cruz, Calif., and the leader of the class that Ms. Harada attended. People who have tried sound healing say they like it because it is non invasive and relaxing. And lying on a cushion, exercising only the ears, is decidedly easier than stretching into the downward dog pose. But can chanting "om lam hu" or blowing into a didgeridoo really loosen a stiff neck? No controlled clinical trials have been done to show that sound healing works, said Dr. Vijay B. Vad, a sports medicine specialist at the Hospital for Special Surgery in Manhattan and a doctor for the P.G.A. Tour. But those who try sound healing may feel their pain diminish, because pain is notoriously subjective, Dr. Vad said. Some 35 percent of people with back pain find relief from a placebo, he noted. Sound healing, like other mind-body treatments, he said, could act as a placebo, or it may distract the mind, breaking a stress cycle. "Even if it breaks your cycle for 15 minutes, that's sometimes enough to have a therapeutic effect," Dr. Vad said. Sylvia Pelcz-Larsen of Boulder, Colo., an acupuncturist who was suffering from excruciating back pain, tried a form of sound healing called Acutonics, which involves applying tuning forks to acupressure points on the body. "I got a 10-minute session, and my back was about 80 percent better," she said. "It changed my life." Ms. Pelcz-Larsen now teaches classes through the Kairos Institute of Sound Healing, which is based in New Mexico but offers classes throughout the world, and has incorporated tuning forks into her acupuncture practice, along with Tibetan singing bowls, planetary gongs and chimes. Using forks and bowls for anything other than dinner may seem to some people like New Age nonsense. But healers, sometimes called sounders, argue that sound can have physiological effects because its vibrations are not merely heard but also felt. And vibrations, they say, can lower heart rate variability, relax brain wave patterns and reduce respiratory rates. When the heart rate is relatively steady, and breathing is deep and slow, stress hormones decrease, said Dr. Mitchell L. Gaynor, an oncologist and clinical assistant professor of medicine at Weill Medical College of Cornell University in New York and the author of "The Healing Power of Sound." That is significant, he said, because stress can depress every aspect of the immune system, "including those that protect us against flu and against cancer." Sound healing works like the cry you make when you stub your toe, said Jonathan Goldman, the director of the Sound Healers Association in Boulder, and the author of "Healing Sounds: The Power of Harmonics." "Have you ever been able to stub your toe and not make a sound?" he asked. "It hurts a lot more." The cry, he suggested, may stimulate endorphins or create resonance with the part of the body that is in pain and lessen it. Or, he said, the cry you emit may simply distract you from the pain. Dr. Gaynor distinguishes between curing and healing. To "cure" means physically to fix something, whereas "healing" refers to wholeness, a union of the mind, body and spirit, he said. Dr. Gaynor, who has an oncology practice in Manhattan, considers sound healing integrative medicine: not an alternative to science but a complement to it. He leads free biweekly support groups for his patients that involve chanting and playing Tibetan singing bowls. The bowls are made of several kinds of metal; when struck gently on the rim with a wood baton, they vibrate at different frequencies, making sounds not unlike church bells. When Marisa Harris of Manhattan first saw Dr. Gaynor with one of his Tibetan bowls she thought he was going to prepare pasta. But when he began to play them, she said, it was the first time since she had been diagnosed with Stage 4 pancreatic cancer that she could hear something other than the words "you're going to die." "It was as if all of a sudden there was room for possibility," she said. The sound, Ms. Harris said, penetrated her body and made her feel as if it were not only her thoughts about death that were breaking up, "but these poisonous cells, these cancer cells, were breaking up and I experienced something very healing." Mr. Goldman draws an analogy between sound healing and prayer. Many cultures, he said, believe that vocalizing a prayer amplifies it. By the same token, he said, expressing what you want a sound to accomplish (Ms. Harada's wish to release the pain in her left shoulder, for example), can help you heal yourself - or someone else. Dr. Gaynor likens sound healing to music therapy. In "The Healing Power of Sound" he cites studies indicating that music can lower blood pressure, reduce cardiac complications among patients who have recently suffered heart attacks, reduce stress hormones during medical testing and boost natural opiates. 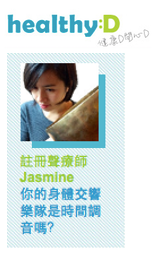 But not everyone who partakes in sound healing is in need of medical treatment. Ms. Harada's husband, Greg Bergere, attended the sound healing classes in Emeryville even though he had no physical ailments. They left him feeling refreshed. "It felt like I just had a really relaxing night's sleep," he said. For some people, that alone may be worth the price of a singing bowl.